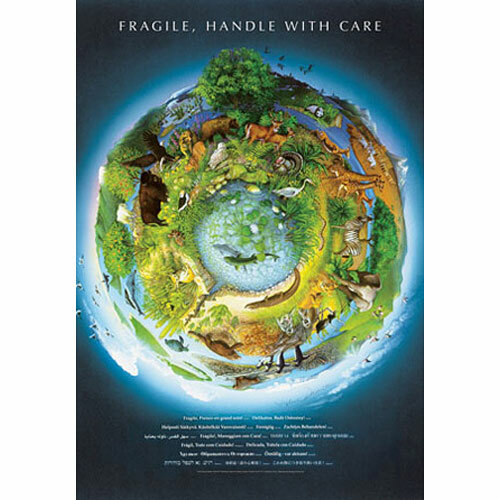 Safari LTD offers a wide variety of vibrant, richly detailed educational posters that feature a diverse array of subjects. Some encourage the awareness of fundamental aspects of an animal's life, where others allow children to learn key scientific information on man fascinating topics. Several of our newest posters outline and show detailed information on global warming, earthquakes and volcanoes. Others provide information on the worlds of snakes, frogs, dinosaurs, horses, bats, wolves and much more. Safari also carries a comprehensive line of accurate dinosaur themed posters. All are a perfect complement for lesson plans and are also ideal for any classroom wall. All posters are available non laminated, laminated in 3 mm plastic, rolled sleeved or laminated rolled sleeved. Featured poster is Fragile Earth. Size: 24" W x 36" H (61 x 91 cm).